Christmas trees are a big business in NC and gardeners can learn a lot from tree farmers. A lot of science and tradition go into these trees. In this episode we visit a farm, a tourism official, an Extension agent, and a scientist who help bring this all together. I spent a lot of time talking to gardeners, you’re the first person I’ve ever talked to who says planting 6000 trees is no big deal. (Laughs) Well, its… A lot of my friends that have seen me in this business and they’re kind of going out of the business they’re older. They’re saying I’m crazy. I can get another few crops off, maybe. And I just want to instill this in my son. North Carolina produces more Christmas trees than just about any place in the country. Our trees are sold up and down the east coast, out into the midwest, and some are even shipped internationally to Europe and South America. These trees are grown by hand and I’ve discovered that gardeners can learn a lot from Christmas tree farmers about land management and pest control. But after spending time on a Christmas tree farm I’m vowing to never complain about digging holes to plant a tree again. I’m not a fake tree person. I get the argument about convince and all, but I just don’t want a big lump of plastic as a centerpiece in my family’s holiday memories. We’ve bought our trees from the same farm for nearly 20 years. The weekend after Thanksgiving when the world has gone insane shopping we start enjoying Christmas together. I knew North Carolina grows a lot of Christmas trees but I hadn’t really given it much thought until I got a email from an extension agent in Watauga county. I went looking for a story about trees but I ended up learning a lot about hard work and family. I’m Paige Patterson, I’m the horticultural agent here at the Extension Service in Watauga County. I work with homeowners and the Master Gardener program. I answer all kinds of phone calls when people are having problems in their home landscapes. I also work with commercial landscapers as well as one of my big roles is with Christmas tree farmers. Is this a big business Paige? Yes, its a big business. A lot of people don’t realize it. They just drive past all these fields of Christmas trees and don’t really think that that represents the livelihood of a lot of people in our area. North Carolina is the number two Christmas tree producing state in the nation. That’s all in the counties in western NC that are producing Christmas trees. Now there are tree farms in the eastern part of the state, but they tend to be smaller, choose-and-cut farms and they are different species of trees. In North Carolina the Frasier Fur reigns as the most popular Christmas tree. For many reasons. One being that it really holds onto its needles for a long period of time. People want to be able to put up trees really early nowadays. At Thanksgiving they can put that tree in their house. By the middle of January it looks almost as good as the day it was cut. They hold their needles a really long time. They are nice, dark green color and have a nice scent to them. It can take 7 to 10 years for a Christmas tree to be ready for market. Paige, is it just as easy as putting a tree in the ground and coming back in 7 years? (Laughs) No, there’s a lot more involved. Just like anything its never simple. You start out with a seedling that’s at least two years, most of the time three years old. So the seedlings is typically grown somewhere else. Most people don’t grow their own seedlings. They are buying them in from other sources. So they’re planted out in the field. You have to keep the weeds from growing up around the trees. But, while herbicides are used to do that, we don’t want it to be completely bare ground. It’s put into maintaining a ground cover of flowering weeds like clover. So typically that involves using a really weak herbicide three times a year. Just to make it where the weeds aren’t out competing the trees. So you can walk through the fields to do all the other things you have to do. You have to cut them back and check for insects and just keep an eye on things that there aren’t any populations that aren’t getting out of control. This becomes a little more important later on in the tree’s life. The first few years if you get a little bit of damage that can be tolerated because it still has years before its got to be ready for the market. Also every summer the trees have to be sheared. That’s all done by hand using these knives and hand pruners. They cut the tops with hand pruners and swing the knife kind of like a machete to shear off the side of the tree to get that nice cone shape to it. Hand planting, hand shearing, continually scouting for pests. All of a sudden what I pay for a Christmas tree is starting to seem like a great bargain. But our family’s tradition is more than just the tree. My next stop was to the visitors’ center to find out why so many people come to the high country during the holidays. My name is Candice Cook. I’m the Director of High Country Host. We are a regional visitors’ center and tourism marketing organization. Candice, why do people come up here to the high country? Well to me the most special thing is that we are about 10-15 degrees cooler than the rest of the state at all times and we have the best mountain views and we have hundreds of miles of the Blue Ridge Parkway and lots of outdoor adventure. It’s just a great place to come and feel refreshed. 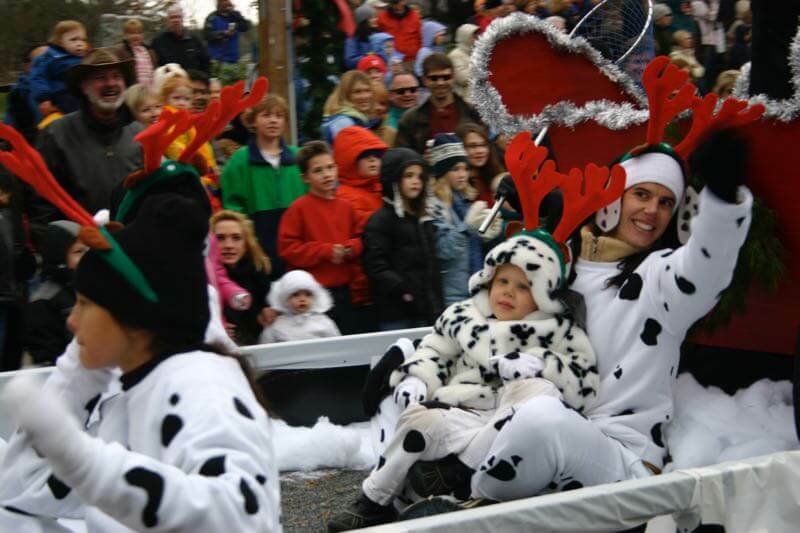 We have parades starting the week before Thanksgiving all the way until the first week of December. 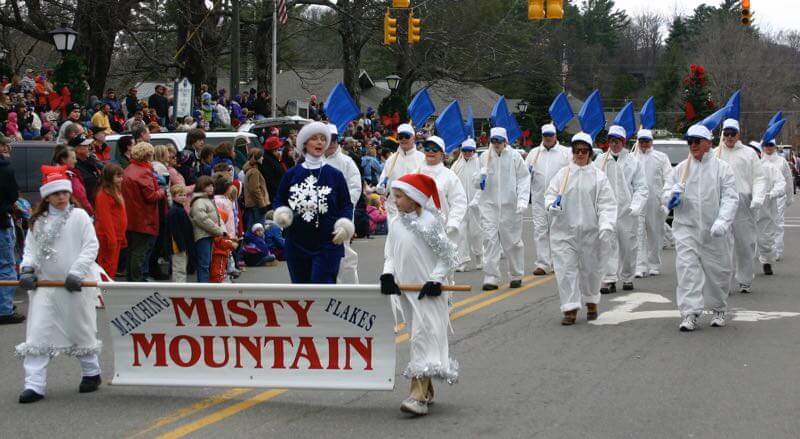 So if you can’t come that holiday weekend there’s always going to be a parade for you in the high country. 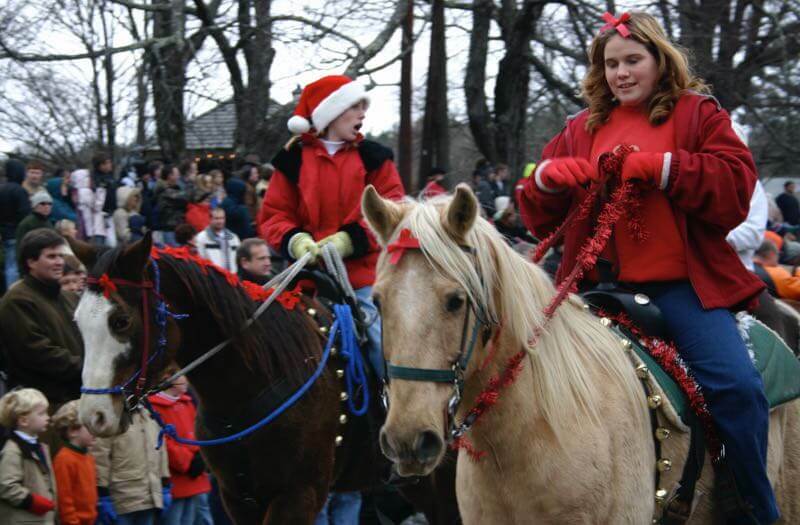 But the parades are great because they are small town parades. 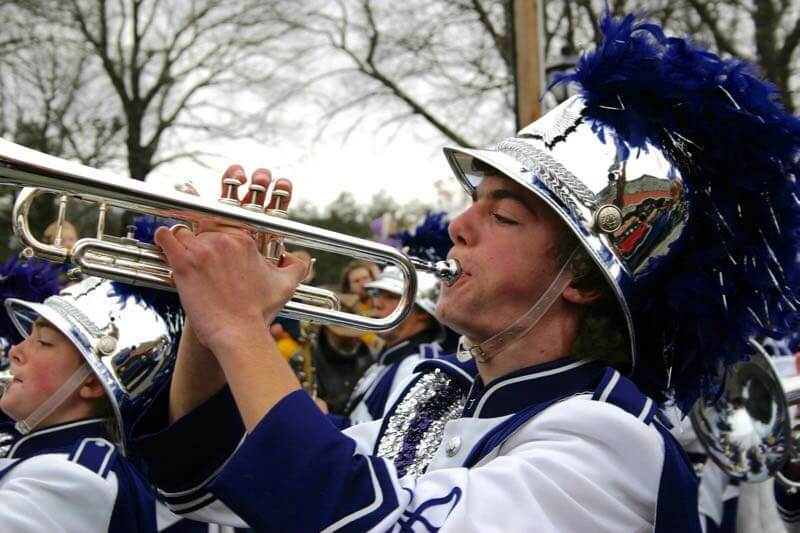 So you’re not going to have that big Macy’s Day parade experience but you’re going to see a lot of local bands, you’ll see a lot of people who get really into decorating their floats. A lot of the Christmas tree farms like to do their own floats. So of course, they’re going to have great garlands and Christmas trees on them. 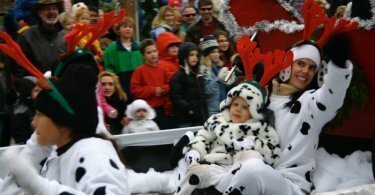 And a lot of the ski resorts and a lot of the snow sports will be out in the parades too with their characters and their mascots and that kind of thing, which is really fun. 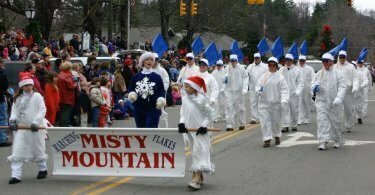 A lot of the people who go to these parades, I like to get there early because there’s always something going on before or after the parades. We like to go to the parades. I’ve put some pictures on our website, TriangleGardener.com. 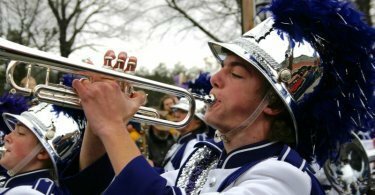 They reminds me of marching in my high school band and things we did as kids. 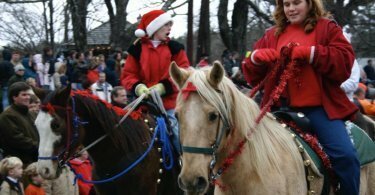 You can find a list of parades, special events, places to stay, and tree farms to visit at MountainsofNC.com. I’ve only been on Christmas tree farms in the winter, there’s often snow on the ground and we’re focused on finding the perfect tree. So when Paige offered to make arrangements for me to visit with a farmer who grows trees on his family’s land outside of Boone, I jumped at the chance. I’m Joey Miller. I grow Christmas trees. What’s the hardest part about being a tree farmer? For me its probably the trimming, because I do it all myself. The planting, once you plant them they’re done. You may replant a few, and the cutting the bailing is just a month of good hard work. So probably shearing. My Roundup, the herbicide spray, I don’t use a big amount of that. Once I get the other 6,000 planted I may have to do better with that, but right now I can just kind of weed eat and mow and just keep it all contained through the year. (Laughs) Well, its… A lot of my friends that have seen me in this business and they’re kind of going out of the business they’re older. They’re saying I’m crazy. I can get another few crops off maybe. I just want to instill this in my son and let him realize that you can be on a farm. I’m all for him to go to college if he wants. But if he wants to just farm, he’ll know how. Just being out in it. Just out here working every day. Even the shearing. It’s hard work. But just being out in the sunshine, or rain, or whatever. Just enjoying life. Joey is excited that his son is interested in the farm and has started going with him to the NC Christmas Tree Growers meetings. He’s been with me all summer working in it. When it comes to trimming or weed eating, or when I’m out mowing my rows. He’s right here. He’s going to the meetings with me, he’s going to his first one. This one is the annual Farm Tour meeting at Meadbrook Inn. We have a lunch and a lot of discussion and some grading of trees. Different ideas and things and then on Saturday I’m driving a van and we’re taking a farm tour to three different farms to look at trees and check out some pests. Get some knowledge about that. Jill Sidebottom is going to be there discussing that. So it’s an all day thing. Eat lunch, cook out on Saturday. It’s an all day thing. Controlling pests is a huge concern for the farmers because years of work can be ruined in just one season. Joey had mentioned Dr. Jill Sidebottom, she’s an expert with the Extension Service so I called her up to find out more about the science behind these trees. My name is Dr Jill Sidebottom and I am the Area Extension Specalist with the NC Cooperative Extension Service working with mountain conifer integrated pest management. That’s a really long job title. But it pretty much translates into working with pest control in Fraiser Fur Christmas trees in the mountains. Dr Sidebottom tell me why we need to worry about pests in Fraiser Furs? When people bring a tree in their house, they want a beautiful green tree. They don’t want it to have yellow foliage or have issues with those needles falling off and so some of our pests can impact the cosmetic look of the tree. But then there are others that can kill the tree. Our main pests are those that aren’t native to North America but have been introduced from Europe or Asia that our trees don’t have a lot of natural immunity to. So if growers didn’t control those they would have, they wouldn’t be able to grow the tree. Or sometimes those pests can piggyback on a tree and it can effect when it’s shipped to other areas of the country or other parts of the world where that pest isn’t found. The idea is that you can spray pesticides every day from now ’till kingdom come but you’re never going to kill everything that’s out there. And you wouldn’t want that because nature has a certain balance. So what we want to do is pest control that works with nature’s balance to keep the pest levels below a grower’s ability to sell that tree. But you want to do that by working with nature instead of against nature. I visited a tree grower and noticed there were a lot of wildflowers in his field and I was thinking how pretty those were but he explained that they were there for a purpose. Is that part of what you’re talking about? It is. So in Christmas trees two of the practices that can really effect pest control is first of all fertility. If you fertilize things with a lot of nitrogen that makes the plant that much better for the pests. So pest levels tend to go up. Also, you want a lot of natural predators there. So by managing ground covers around trees, first of all that tends to bring in white clover and that fixes nitrogen so a grower doesn’t have to apply as much nitrogen. Which means that’s good for them they don’t have to pay for it. And also, it means there’s not as much nitrogen going out. So that tree isn’t as —like one fellow said, putting nitrogen on trees is sort of like tender vitals. It makes the plant really tender and growing good so that pests like to get it. But also those flowering ground covers are attracting natural predators like lady beetles and lacewings and hover files that need that pollen and nectar to produce their young which are going to eat up all those pests. So it’s one of our fundamentals of IPM in Christmas trees in Frasier Furs here in the mountains to have that. Besides that it holds the world together. You’re not going to have problems with soil erriorlsion, it provides habitat for wildlife, it’s just win-win on a lot of different levels. Purchasing chemicals, the time and expense involved in applying them just adds to their costs and cuts into the profits farmers realize from their investment. So they’re serious about integrated pest management practices. Gardeners can learn a lot from them. Driving home I’m noticing the rows of trees along the mountain sides. I’m proud of how the Extension Service and our farmers use science and hard work to grow a tree that my family enjoys every year. I hadn’t appreciated how much work goes into those trees and it’s all done by hand. That’s someone’s living and I’m happy that buying a tree from a farmer means maybe they can continue to stay on their land and keep their family’s traditions. I’m Lise Jenkins. This is the Triangle Gardener show. We’re your guide to enjoyable gardening in North Carolina. You can find our show on iTunes. If you like what we’re doing give us a review. Thanks for listening.